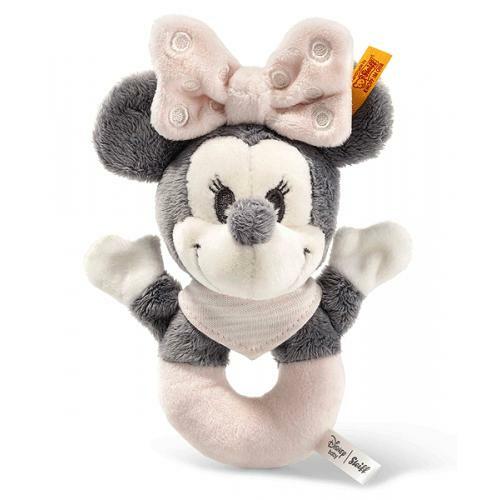 Steiff Minnie Mouse Grip Toy with Rattle is hand made in the finest grey, pink and white cuddly soft plush. ©Disney Minnie Mouse grip toy with rattle is only avialable in Germany, France, Portugal, Spain, UK, Austria and Switzerland. A world-wide star. One of the true greats to this day: Minnie Mouse. Mickey Mouse’s girlfriend. She’s so cute and lovable. The embroidered eyes, long lashes and smiling face sparkle in the beautiful colour of grey. The grip toy and the rattle integrated in the head encourage the motor skills of babies and tiny tots. The funny ears are in grey and the girlish face of Minnie Mouse is rounded off by the cute nose. The head is wrapped in a cute pink ribbon stitched with white dots. The pink and white neckerchief is sewn on. 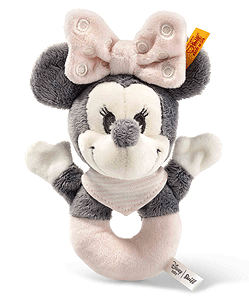 Minnie Mouse grip toy with rattle measures 13 cm and is simply great – for cuddling and snuggling, playing around with and having fun. And you can take her anywhere – in the pram or the car or on holiday. And of course in the evening she’s needed for cuddling in the cot!